The Food and Agriculture Organization of the United Nations, in collaboration with one of A4NH's Managing Partners, Bioversity International, jointly produced new scientific guidelines guidelines for collecting information on food biodiversity through dietary surveys. The publication, Guidelines on Assessing Biodiverse Foods in Dietary Intake Surveys, is meant to assist researchers and practitioners in generating more reliable data and implementing best practices related to assessing food biodiversity. According to the authors, current foods systems are facing mounting challenges to provide growing populations with safe, diverse, and nutritionally adequate foods. This is due to resource constraints, environmental degradation, as well as the continual narrowing of the food base and the loss of biodiversity. In order to mainstream biodiversity and improve nutrition at national and local levels, a thorough understanding of the contribution of food biodiversity to healthy diets and sustainable food systems is needed. While dietary assessment surveys provide information on the nutrient adequacy of diets, few are designed to capture the consumption of foods with taxonomical details below the level of ‘species’. This offers an opportunity to adapt these instruments to better capture this information. 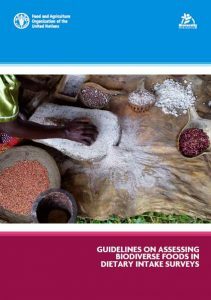 These newly published guidelines can help facilitate the process of collecting better information to guide agriculture practices and programs, nutrition programs and research, and the policy spheres surrounding agriculture, nutrition, and health. The guidelines were developed through an FAO Technical Meeting on the collection of information on food biodiversity and food processing in food consumption surveys, in conjunction with the 20th International Congress on Nutrition.